I adore Designer Con. Every November, artists descend upon Pasadena’s Convention to celebrate Pop Art of all forms. DCon is a mind boggling bonanza of collectible art including paintings, illustrations, plush toys, vinyl toys, street art and one of a kind clothing. With close to 350 vendors on site, there was a lot to take in. Here’s a round up of some of my favorites. 1. Martin Hsu. 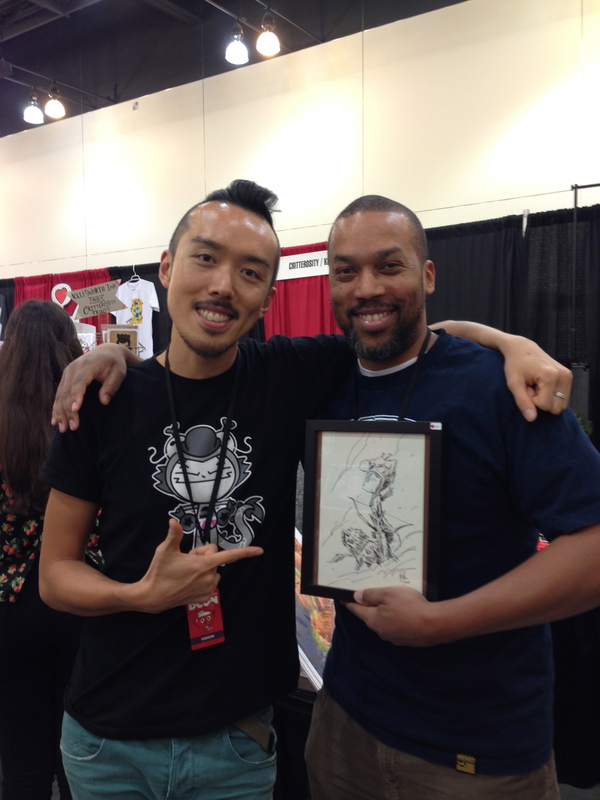 I’ve been a big fan of Martin Hsu’s work since I had an opportunity to see his work at DCon 2013. He’s had a busy year, and it was great to hear about some of his new ventures. My husband picked up a great piece by the artist today. 2. 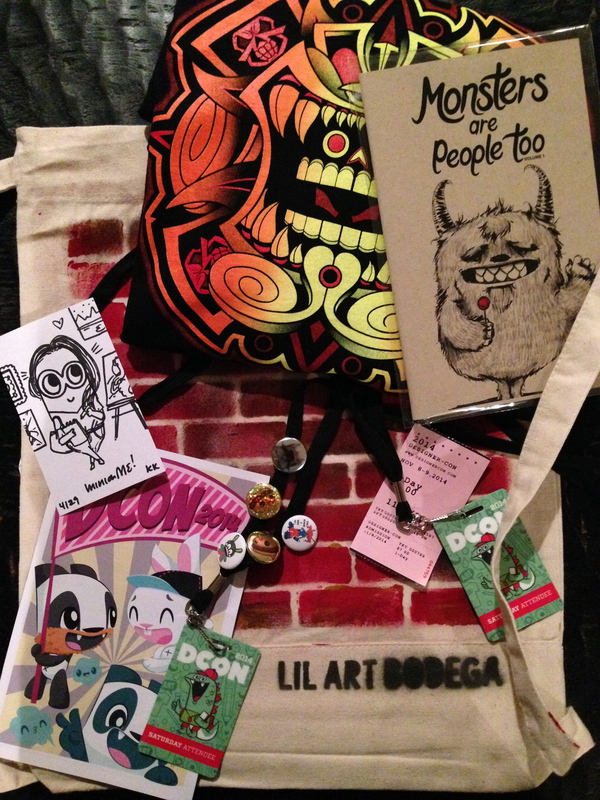 Lil Art Bodega. If you are in Downtown Vegas, go check out the Bodega! They have an awesome collection of one of a kind t-shirts, jackets, bags, prints and unique graphic design. The Lil Art Bodega has roots in NYC and hip hop and artist Tanya MIchelle has curated a great collection Pop art that will make you smile. 3. Speaking of smiles, I was turned into a Minion! 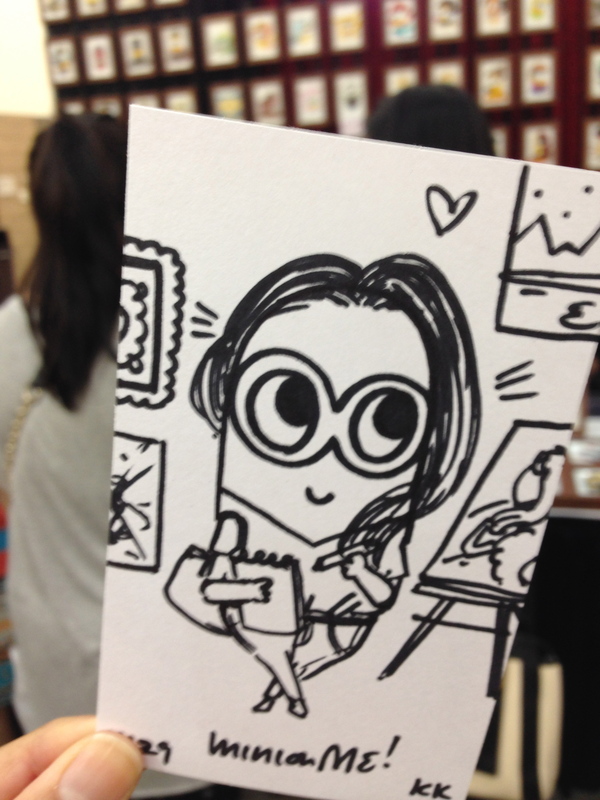 Artist Kris Kehasuk Jaren at Minion Me was on hand doing speed sketches and transforming visitors into cute Minions. Kris got me. I loved this. IMG 8827 from CultureShockArt on Vimeo. 4. The Stoop. This booth featured a collective of cool creatives including Supahcute, Vanessa Ramirez and Orbital Ox, among others. I’ve been a huge fan of Supahcute’s ability to curate and highlight amazing artists. Vanessa Ramirez’s work is awesome, check her work out! I picked up one of her sketch to add to my collection of art books. It was great learning more about her artistic process, which for all the folks on the Stoop included copious amounts of caffeine! My kind of peeps. On the subject of art books, I have so many of them my house is looking like an art library! I just about passed out when I saw the amazing collection of street art photography showcased by Zero+ Publishing and Kirk Pedersen. Kirk has an amazing eye and a gift for bringing together like-minded street artists. It’s a growing, competitive industry whose evolution is captured beautifully by these books. Many are signed and unique limited edition works that are meant to be a showpiece. My Christmas list has a few of these amazing works on it! 6. Urban Aztec. Bay Area artist Jesse Hernandez was getting a lot of love from fellow artists at his booth today and it was easy to see why. His airbrushed work is a stunning homage to indigenous cultural roots and blends animation with paint. He has an impressive resume that includes works shown in the Oakland Museum, the Cosmopolitan, Juxtapose and Rolling Stone Magazine. When I first went to DCon in 2013 I was struck by the level of camaraderie and support the artists and patrons had for each other. I was happy to see that collaborative supportive environment again this year. Designer Con runs through Sunday, November 9th at the Pasadena Convention Center. Love, Love, Love “Minion Me” when I first saw it in the collage I thought that looks familiar?! Then I saw the larger view & explanation…that nailed it!